Happy New Years! It seems black-eyed peas are traditional (somewhere, not sure where?) at New Years, and they are supposed to bring good luck. Well, I happen to love the things though (I'm hesitant to admit) my kids are not such huge fans. Unfortunately their luck in dinner choices was working against them, as I decided I needed to invent SOMETHING featuring black-eyed peas for tonight's supper. Greens seemed the obvious choice, or so my Googling options indicated. And since I had plenty of winter kale, I went with that, plus a few lingering carrots I found lurking in the dregs of the garden - surprisingly none the worse for the wear. With lots of garlic and olive oil, the resulting "Beans-and Kale" mixture turned out, not only quite delicious, but actually deemed as "acceptable" by my children. And surprisingly... well... somewhat pretty, (if kale can be pretty) too. Enjoy, and have a GREAT, and lucky, New Years. Heat the oil in a large saucepan over medium heat. Add the carrot, kale and broth; cover and cook until kale is tender, about 15 minutes. Check once or twice during cooking time; if necessary, add a little water to keep the kale from burning. YUM! So simple and delicious. That photo is great. That dish looks so good an healthy. Your kale and carrots look gorgeous. And I agree with the others: very nice photo. Super jealous that your garden is not buried under a foot of snow and that you are still able to get produce from it! i love my New Years Meal! 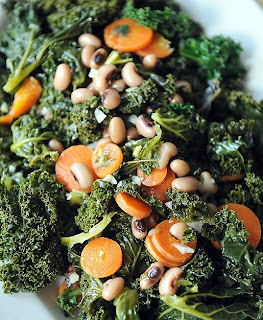 it includes Nava Atlas's Greens w/Black Eyed Peas (from the 5 Ingredient cookbook). so good! perhaps next time i'll try your recipe, it looks great!